Given his status as one of our greatest national treasures, a new Alan Bennett play will always be An Event. They don’t happen that often these days, and this is the first new Bennett play for six years. Once again, Sir Nick Hytner is directing, and once again the show debuts on the South Bank. However it is not the familiar surroundings of the National Theatre that are hosting this time, but the sparkling new Bridge Theatre next to Tower Bridge and City Hall. Since Sir Nick left the NT in 2015 they have had a difficult few years, with a number of high profile flops, and fewer hits heading to the West End, in the footsteps of The History Boys. The Bridge lacks the public subsidy of the National, but it does provide Sir Nick with a beautiful and flexible space for shows. Julius Caesar earlier this year offered a thrilling set up with the cast moving among the paying audience. For Allelujah the setting is more conventional with seats restored in the stalls and the audience looking straight ahead at the stage. The setting is the ‘Bethlehem Hospital’ known by the locals as ‘The Beth’, and, of course, it is in Yorkshire. A hospital for geriatrics, it is popular within the community and does reasonably well at hitting targets. Not surprisingly it is under threat of closure, and the campaign to save it involves bringing in a TV crew to record life inside the place. 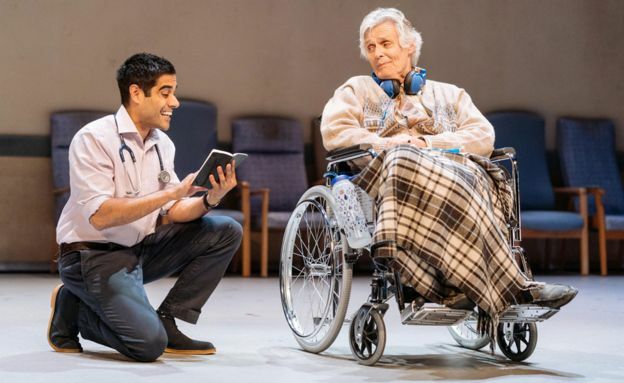 The patients like few things more than to break into song, and, occasionally, dance, with these sequences providing some of the most heartfelt moments of the show. Arlene Phillips was brought in to help with the choreography, and it’s quite a feat, with some of the best on stage dancing with zimmer frames since The Producers musical closed. The hospital staff is a mixed bunch. There’s a young immigrant doctor, a hard-nosed nurse, a heart of gold nurse, a work experience lad and a prattish chair of the Trust. As is often the case with Alan Bennett, the homely set up is there to provide the platform for his worldview. It’s safe to conclude that, in this 70th anniversary year, he loves the idea of the National Health Service, hates management consultants, Tories and reform of the way hospitals are run. He’s not keen on Brexit, although he’s not explicit on that, and he despises ‘hostile environment’ immigration policies. His views on aging are more complex. As an 84-year-old himself, he’s well placed to comment. The people in the hospital may not lead the happiest lives but they retain their personalities and their capacity to enjoy life. They value friendship and companionship and do all they can to avoid loneliness, even if their families rarely make the trip to visit them. Comedy plays a big part in Allelujah, but there’s a darker turn that follows. As you’d expect from a Hytner/Bennett production, the cast is exceptional. Each of the elderly patients gets a chance to shine, with Simon Williams as a retired English teacher getting some of the best lines. Among the younger cast, two of the original History Boys are there, Sacha Dhawan as the immigrant doctor and Samuel Barnett as the management consultant with family links to the area and the hospital (Russell Tovey and James Corden both went along to see the show in the opening week). If there is a star of the show, that prize goes to Deborah Findlay as Sister Gilchrist. She personifies the target culture so disliked by Bennett and the way those targets distort how people behave. 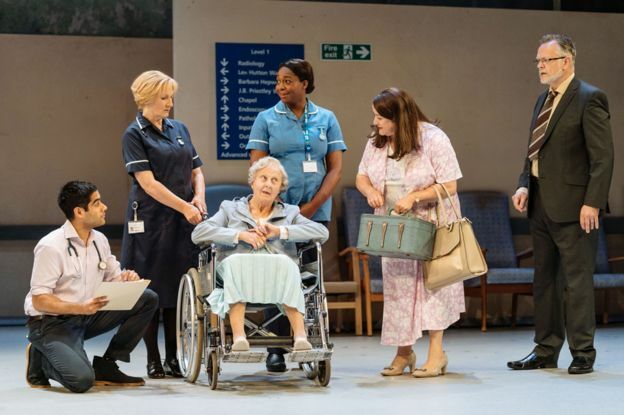 If you like Alan Bennett you will enjoy Allelujah. It’s warm and funny and dark and thought-provoking at the same time. The politics are an Old Labour and North London hybrid and, the hospital on stage is probably more fantasy than NHS reality. But when national treasures do something new, we should all rejoice. Allelujah, indeed.